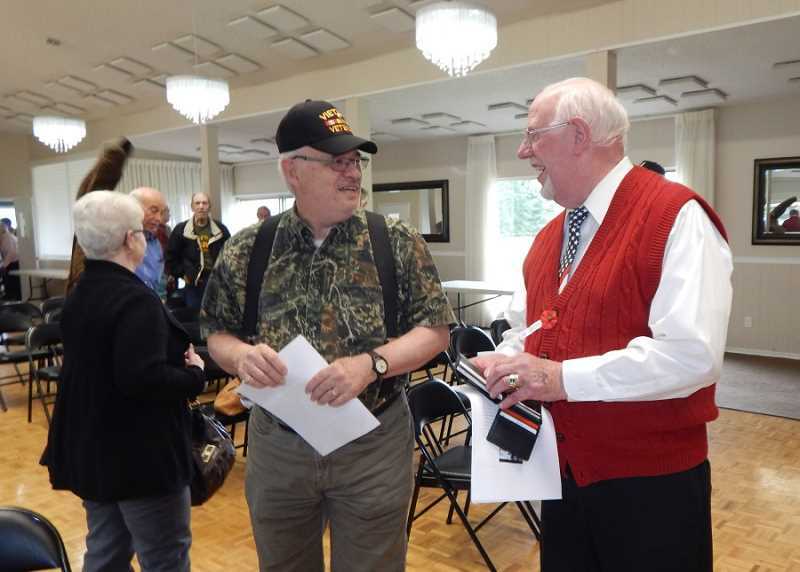 King City's annual Salute to Veterans celebration always features a veteran as the keynote speaker, and at this year's Nov. 9 event, King City resident Jerry Larsen spoke about his service in the Vietnam War. A 1962 graduate of the U.S. Naval Academy, "my class lost the most classmates during the Vietnam War," he said. "We lost 17 classmates, and there were two prisoners of war." According to Larson, as of two years ago, there were 23 million veterans alive, with the bulk of them from Operation Desert Shield, Operation Desert Storm and the Vietnam War. The Gulf of Tonkin incident is considered to be the start of the escalation in Vietnam. The USS Maddox got into a confrontation with North Vietnamese torpedo boats, with shots fired on both sides. Four North Vietnamese sailors were killed, and six were wounded, while no Americans were lost. "Congress gave LBJ a blank check to do what he wanted," Larsen said. "At the end of 1963, we had 15,000 in Vietnam. By the end of 1964, we had 23,000, and at the end of '65, we had 184,000. In 1968, at the peak, we had 536,000, and we lost a total of 58,000. Larsen was gone from home for 10 months, leaving behind his wife, 1-month-old son and 14-month-old daughter. "I missed the first year of my son's life, and at that time all we could do was write letters," he said. "You just hope you're going to come back. I salute everyone who went there and their spouses. I'm glad I did it and want to salute all the veterans who have done the same thing." The Salute to Veterans, which was led by Paul Hailey, also included "Reveille" and "Taps" played by Chuck Marsh; an invocation by Navy veteran Ron Fritch; reciting the pledge of allegiance; and a sing-along of the military branch songs led by Bob Hamlin and accompanied on the piano by the Rev. Elisabeth Hampton; plus a number of local veterans were recognized. Bob Olmstead couldn't serve but he said his dad served in WWII and added, "I missed my dad the first five years of my life. And my three sons served in the Air Force, the Navy and the Marines. I salute each and every one of you." Hailey asked King City Lions Club member and National Guard veteran Bill Gerkin to speak about collecting redeemable cans and bottles, a very successful program that has raised more -than $10,000 and paid for 20 veterans to go on four-day Honor Flight Network trips to Washington, D.C. The Lions continue to collect cans and bottles, and Gerkin said that any veteran who wants to get an application form to take the trip should call Tony at 971-264-0814. Hailey gave the benediction and thanked everyone who helped with the event and especially all veterans.